Resident of Havat Gilad in Samaria briefly detained for questioning after he caught an Arab youth who was throwing rocks at his car. A resident of Havat Gilad in Samaria was briefly detained for questioning after he caught an Arab youth who was throwing rocks at his car. The incident occurred in the village of El-Funduk in central Samaria, several kilometers west of Kedumim. 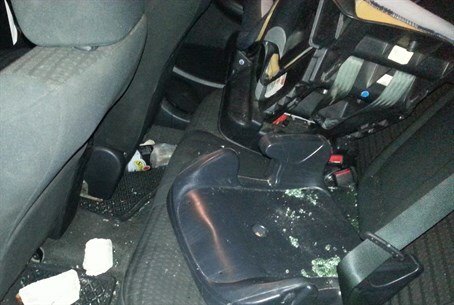 The driver said that he saw the Arab, who was about 15, throw a rock at his vehicle. The youth then ran into a store on the side of the road to hide. The driver stopped the car and ran after the culprit, caught him, and called the police. Meanwhile, an Arab mob surrounded the driver, threatening to lynch him unless he freed the stone-thrower. The driver, determined to hold onto the culprit until police came – and to defend his life – took out an axe that he had in his vehicle's trunk, an implement he had due to his work as a contractor. When police arrived they took the rock-thrower – and the driver – into custody, on charges of threatening the Arab mob with his axe. He was released about an hour after he was arrested. Attorneys representing the driver said they would demand a harsh sentence for the rock thrower, to ensure that others are discouraged from operating in the same manner.